Bahia | WHY DO WE LOVE CHOCOLATE? Cacao is the fruit of the cacao tree, a tree of medium dimensions – between 4 and 8 meters – with long leaves of approximately 30 cm. the fruit measures between 15 and 30 cm in length and has a width of 7 to 12 cm, ellipsoid shape and contains 30-40 kernels. It is native to the rainforest areas of tropical America, and in its progression has given origin to two important groups: criollo and forastero. The latter became diffused in the Amazon Basin, and is considered the real Brazilian cacao, with its egg-shaped fruits with a smooth, slightly furrowed or wrinkly surface and purple seeds. 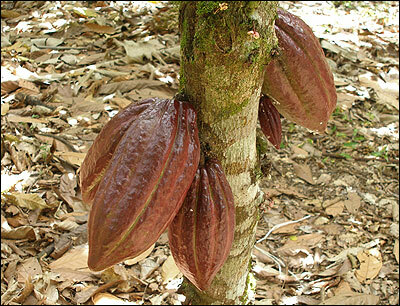 A mutation of forastero cocoa gave light to catongo cacao, with white seeds, discovered in Bahia. 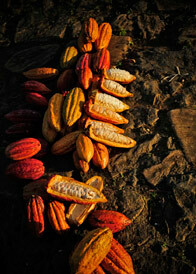 Cacao has best adapted to the south of this state, where 95% of all Brazilian cacao is produced. In Bahia, the first historical record of cacao dates back to 1655, when D. Vasco de Mascarenhas sent a letter to Major-Captain Grão-Pará, talking about his fondness of the fruit. 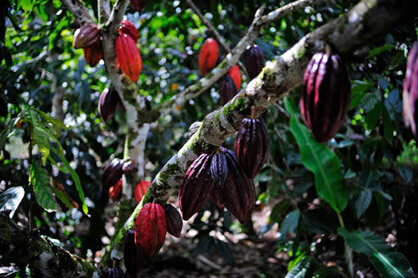 In 1746, cacao started being cultivated in southern Bahia, especially in the county of Canavieiras. In 1752, it reached Ilhéus, and ever since it has been the most characteristic local cultivation. Adapting very well to the Bahian Atlantic Forest, it had become the most important export of the state by the early 20th century. After the incidence of witch’s broom in the area, an illness affecting cacao trees caused by a basidiomycete fungus, which significantly decreased local production, fungus-resistant varieties were introduced to the area, among which Theobahia and the clones CEPEC 2002-2011 are especially worth mentioning, making up a large part of trees in many production areas. 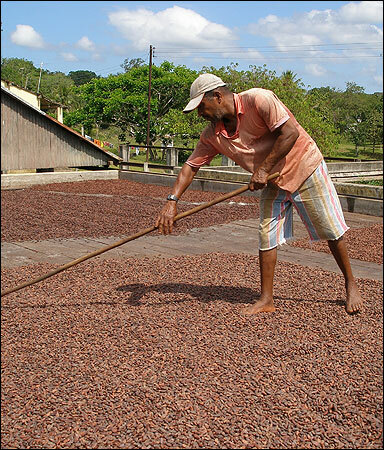 In the Bahian cacao region, much local knowledge and experience has developed, giving birth to a unique agricultural model – the cabruca system. The traditional cacao planting method of southern Bahia follows the “cabrucated forest” system, characterized by the planting of cacao trees in the shade of Atlantic Forest trees, and has been used in the area for more than 200 years. This practice was devised by the first immigrants, and can thus be considered a precursor to current agroforestry systems. Frequently, cabruca cacao is associated with organic cacao production. However, not all cabruca cacao is organic, as the cabruca system only implies the type of plantation (in the shade of Atlantic Forest trees), but leaves it up to the farmer if he wants to use pesticides or other techniques for controlling pests. Despite this, many cacao growing communities and farms of southern Bahia produce organic, agroecologic cabruca cacao, in order to have good, clean and fair fruits. All of this explains why the area is known as “Cacao Region”, being mentioned even by great writers such as Jorge Amado, retelling its story, which is tightly connected to the culture and history of the area. This is why a big part of the local tourism is oriented towards cacao and its most famous product, chocolate. Volgens historici werd cacao gecultiveerd door de Indianen, vooral de Azteken in Mexico en de Maya’s in Centraal Amerika. Cacao, cacahualt genoemd, werd als heilig beschouwd en zijn zaden waren zo waardevol werden ze zelfs gebruikt als betaalmiddel. DOCUMENTARY FILMED IN THE TRADITIONAL SOUTHERN REGION OF COCOA PLANTATIONS IN BAHIA, BRAZIL, FILMED BY JOURNALISTS AND FILMMAKERS MASTERS OF NYFA – NEW YORK FILM ACADEMY, FOR THE PURPOSE TO PRESENTES THIS REALITY FOR THE WORLD, DURING THE RIO +20. – UNITED NATIONS CONFERENCE ON SUSTAINABLE, IN RIO DE JANEIRO, BRAZIL ON JUNE 2012. Joao Tavares, a fourth-generation cocoa farmer in the eastern state of Bahia, Brazil, grows chocolate using a method called cabruca. 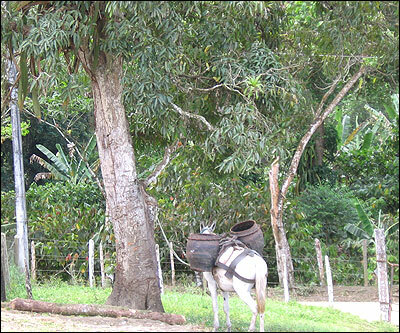 His cacao trees are grown under the canopy of larger rainforest trees. And here’s the climate connection. Rainforest trees and plants store massive amounts of carbon — keeping it from getting into the air as carbon dioxide. There’s a lot less rainforest than there once was. There used to be 330 million acres of rainforest in eastern Brazil, called the Mata Atlantica. Settlers arrived hundreds of years ago and began destroying the forest for the wood, and to create fields for pasture and crops. Only 7 percent of the Mata Atlantica remains, and destruction is still going on. Every time a tree is burned, its stored carbon is released. As more carbon is released into the air, the planet gets warmer. 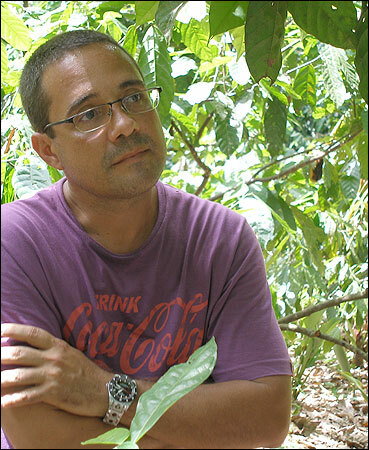 Dario Ahnert, a plant expert at the State University of Santa Cruz in eastern Brazil, is trying to help farmers grow chocolate that is both profitable and helps preserve the forest. Inside Tavares’ cabruca forest, the ground is covered in a thick layer of composting leaves. It’s moist, shady and cool here in the cabruca. Football-shaped pods — striped in yellow and green and orange and brown — jut out from the trunks and branches of the cacao trees. There’s also an expanding market for environmentally friendly chocolate. Tavares has been able to get a premium for some of his crop. Tavares has planted his cacao trees — the source of chocolate — under a taller canopy of rainforest trees in cabruca-style farming. Still, his friend, professor Ahnert, admits that cabruca is a tough sell: Farmers want more so-called modern approaches and quicker money. That’s why Ahnert hopes that cabruca can become part of the carbon credit market. 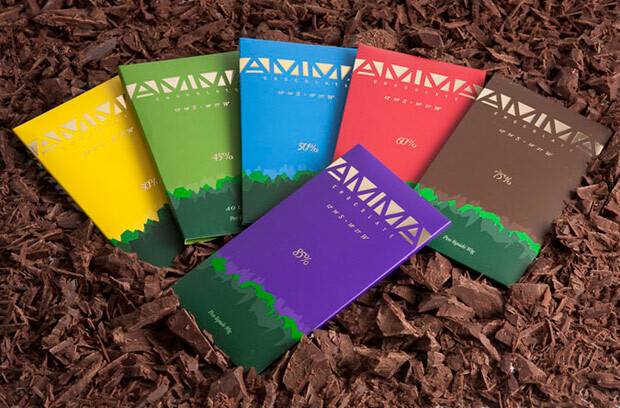 Farmers would then get money for preserving forest trees, as well as for their chocolate. “You could increase the income, so I hope some day people that maintain this area are able to get carbon credits,” Ahnert says. The cocoa beans are dried in the sun. A worker on Tavares’ farm rakes them to make sure they are all exposed and dried evenly. And there’s an even more ambitious idea out there. 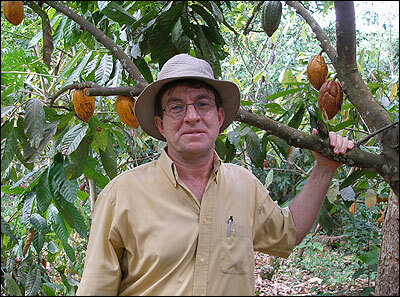 Howard Shapiro, chief agronomist at Mars, hopes that chocolate could even bring back a little of the forest paradise that’s been lost. He’s doing tests with local scientists at Brazil’s national chocolate research institute. “This is an area that’s been planted on degraded land,” Shapiro says, giving a tour of the three-acre research plot. They also planted rubber trees, and heliconium flowers. The first plants went in seven years ago. Now it’s easy to grab a handful of soil. It’s dark brown, moist and crumbly, like devil’s food cake — with worms. But the worms are good for the soil. 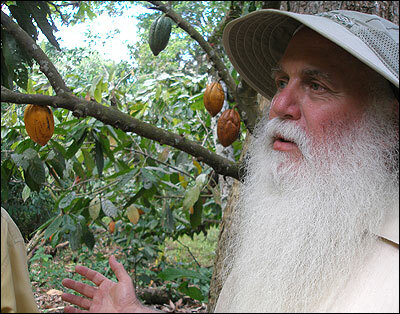 Howard Shapiro, chief agronomist at chocolate manufacturer Mars Inc., is working with Brazil’s national chocolate research institute to make abandoned, deforested land profitable again. The experiment includes planting many cash crops, including chocolate. Shapiro wants to work out the details, but he’s ready to say the project is a success. “We learned that you could take totally abandoned land, and you could restore it to profitability after about three years,” he says. So, will preserving, and even replanting, some of this forest in eastern Brazil fix the Earth’s climate problem? No. But in this little corner of the world, it may help. And at least we’ll have more chocolate. NPR encourages and permits links to content on the NPR Services. However, NPR is an organization committed to the highest journalistic ethics and standards and to independent, noncommercial journalism, both in fact and in appearance. Therefore, the linking should not (a) suggest that NPR promotes or endorses any third party’s causes, ideas, web sites, products or services, or (b) use NPR content for inappropriate commercial purposes or in any way that is unlawful or harmful to any other person or entity. We reserve the right to withdraw permission for any link.